A native of the Sonoran Desert region of Southern Arizona and a child of parents from the old Spanish settlements of northern New Mexico, Antonia Gallegos sculpts figures of women who embody the femininity and strength of her heritage. With a blend of both Native American and Mexican influences, the bronze sculptures by Antonia Gallegos manage to project a powerful presence with great simplicity of form. She’s largely self-taught, with her great gift being the ability to capture authentic womanly forms and authentic impressions – whether it’s pensiveness, strength or humor. Her pieces are grounded in their woman-ness and that gives each a great authority. While the childhood of artist Antonia Gallegos was colored by her family’s need to migrate along with many other families of farm workers – always following the harvest – her early memories are happy ones. The sculptor she would become sprang from the young girl she was - making her own toys from adobe clay and admiring the altar sculptures at church and the forms and beauty in the paintings on the church walls. But it was not until Antonia Gallegos reached her fifties, after the necessity of providing for the three children she raised, that she was able to turn her devotion to the inborn talent waiting patiently to be honored. The work Antonia Gallegos now produces embodies a lifetime well lived with all its attendant joys and sorrows, play and struggle. Antonia Gallegos is an intuitive sculptor who is influenced by all that she is as her hands bring every facet of this gifted woman and gifted artist into the solid form of her remarkable sculptures. 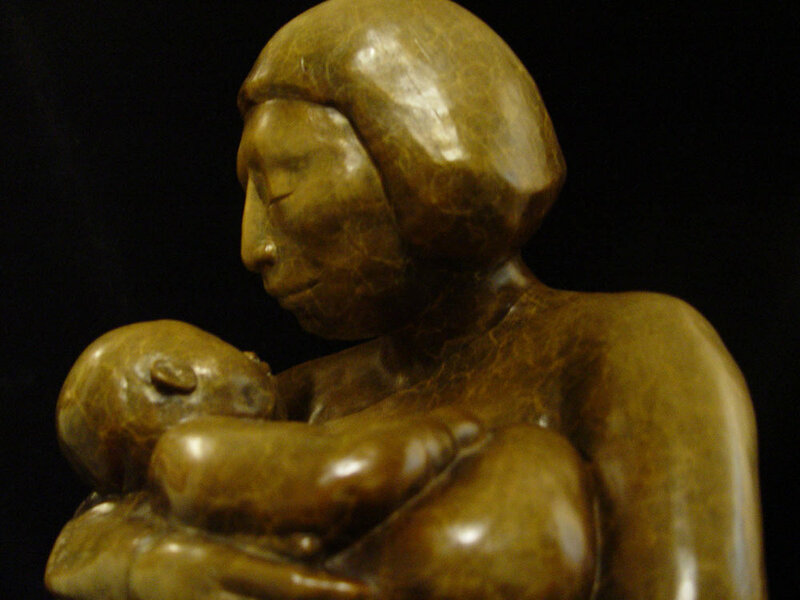 Antonia Gallegos has collaborated with three other sculptors on a unique and heartrending project called The Mothers; Las Madres/No Mas Lagrimas; No More Tears. The artists have created powerful sculptures which take the issue of immigration out of the political realm and into the realm of the heart, in which we each share a common humanity. Gallegos herself served as model for Las Madres which reflects the human suffering of migrants coming across the Mexican/American border in search of work – each sculpture represents over 1000 men, women and children who have lost their lives in the desert. To watch a powerful video on this project click here.